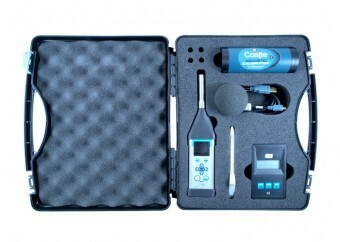 Castle Group Ltd has launched a brand new sound meter, the MIRUS. This pocketable meter is wafer thin and yet packs a serious punch in its performance! With a colour screen that rotates, full octave and 1/3 octaves options, a simple user interface and extendable memory, it can cover a multitude of applications from the palm of your hand. The Mirus is available with or without octave and 1/3 octave band frequency analysis capability and will store a broad range of sound parameters across 3 measurement profiles. Once a few basic settings have been chosen, the meter is always ready to go with just one button. Results are stored on a micro-SD card so there’s no limit to the amount of data that can be saved. The meter is suitable for many applications, but is particularly suited to Noise at Work and Environmental assessments, with parameters appropriate for both. There is also a dosemeter mode, which gives exposure parameters such as Lepd and DOSE%. Visit the Castle Shop here for more technical detail. Measurements are then transferred to the PC software, which can perform further analysis and will display the results in tabular and graphical form. This data can then be directly transferred to a word processor or spreadsheet program to include in standard company reports. For more information please contact: Dianne Hamblin on 01723 584250 or contact us here.